Meet A-Ul, a rescued Bornean Orangutan. All photos by Owen Morgan. 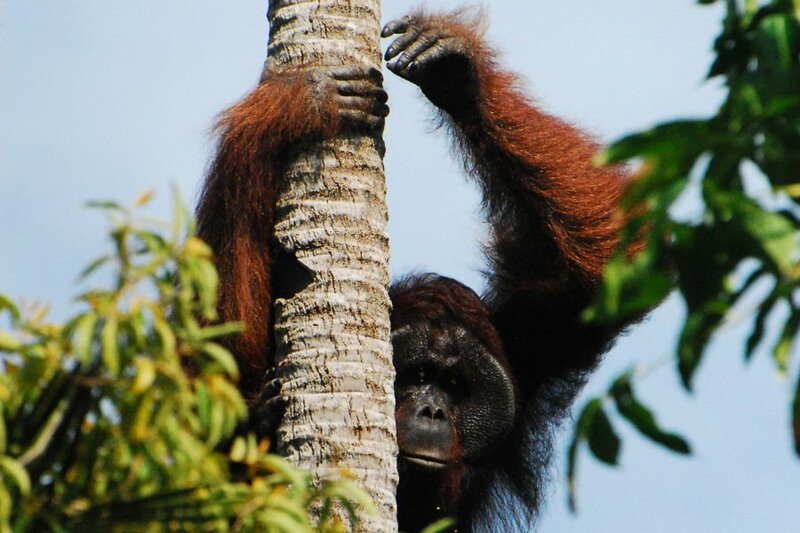 Ancient headhunting practices, diverse ecosystems, and an orangutan named A-Ul. For outdoorsman Owen Morgan, the call of the mysterious island of Borneo led to lifelong friendships. INDONESIAN BORNEO — Borneo, the third largest island in the world, has captivated the hearts of explorers for centuries. The island is made up of three different countries — Malaysia, Indonesia, and the independent Sultanate of Brunei. Dayaks, Borneo's ancient indigenous tribe, still populate the island, although they have long since discarded "headhunting," their ancient practice of preserving and displaying the heads of their dead. Borneo is as rich with culture as it is with biodiversity — its many rainforests and surrounding reefs are heterogeneous ecosystems. It is because of this that Borneo has always held a special place in my heart. I set out for Borneo as part of an around-the-world adventure. I had enough with being a regular tourist and decided it was time to take the road less traveled. For me, that meant journeying to developing countries and getting involved with different nonprofit organizations that offer volunteer projects to help humans, animals, and the environment. Volunteers work hard to build a feeding tower for this little guy. I joined a team of four volunteers in the small city of Ketapang to work at the pioneering orangutan rehabilitation center created by International Animal Rescue. The staff of this British-based charity have given up all creature comforts to work tirelessly on the conservation and protection of Bornean orangutan populations. I signed up with , a United Kingdom-based organization that coordinates with local charities to create ecofriendly volunteering experiences that save endangered species around the world. At the time, International Animal Rescue was a small center that cared for about 30 injured or orphaned orangutans. Our task was to build a new feeding tower, three stories high, and to assist the local team of builders and vets enrich the enclosures with food-based toys and puzzles to keep the apes mentally stimulated. It was an intense four-week program that involved laboring in the heat of the Bornean sun, but to see the infant orangutans climb over their new platform was a joy to behold. 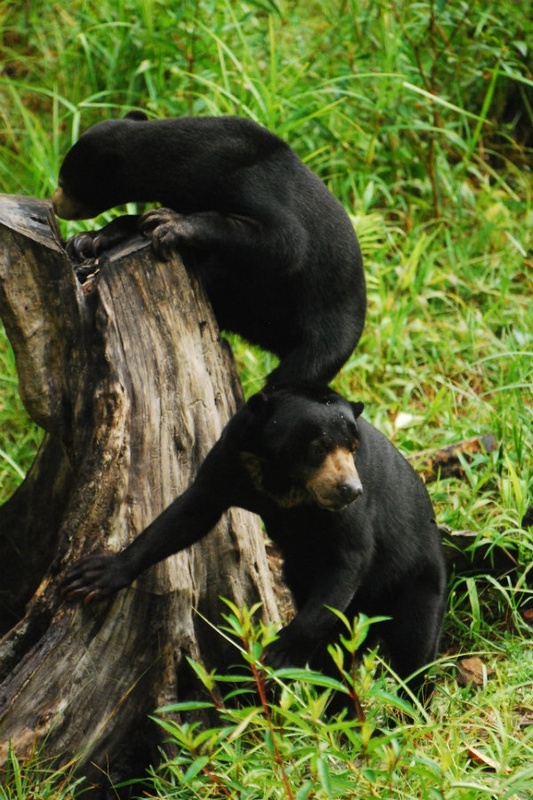 A pair of sun bears forage for berries and fruit. 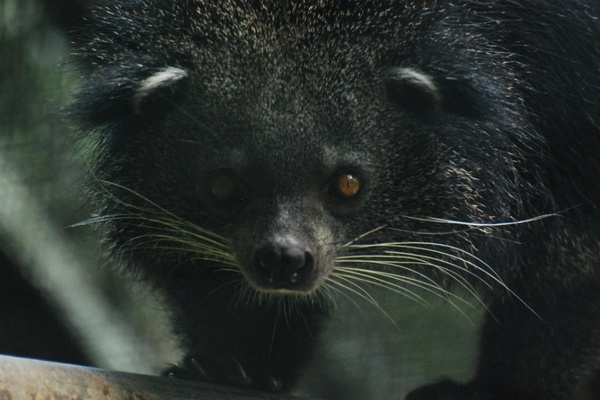 Meet the binturong, a mysterious animal known by locals as "the bear-cat". The experience was so rewarding that I returned to Ketapang two years later to see how the orangutans were faring since our last visit. On the way, I stopped in the city of Kuching, in Malaysian Borneo, to work alongside native animals such as sun bears (the smallest bears in the world), binturongs, hornbills, gibbons, and pythons, as well as the resident orangutans. The projects varied day-to-day — cleaning out the animal dens, constructing a python enclosure, and building new animal enrichment devices kept us extremely busy. Working so closely with these animals allowed us to connect with them on such a level that we felt we knew their personalities. We would marvel at their progress towards recovery from their previous lives in chains. Our return to Ketapang was met with many positive changes in the center since our first visit in 2011. The pioneering project had developed dramatically — the number of apes had doubled (it now housed over 60), and the center had relocated away from the city to back into a small forest in a rural township. 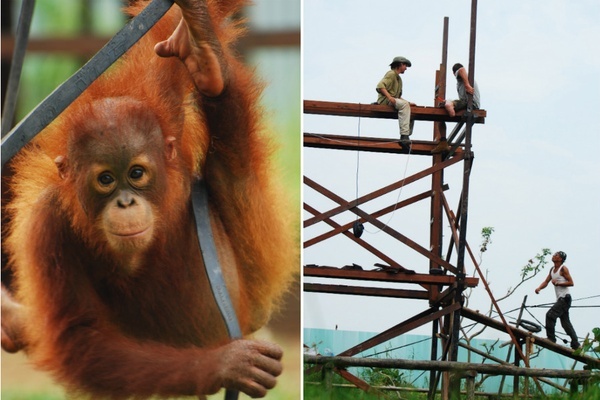 The forest gave the young orangutans a crucial chance for some natural rehabilitation. Each day they were let out in small groups, which we called "Jungle School," to re-learn and practice natural climbing skills that would have been passed on to them from their mothers. The International Animal Rescue team locates A-Ul. 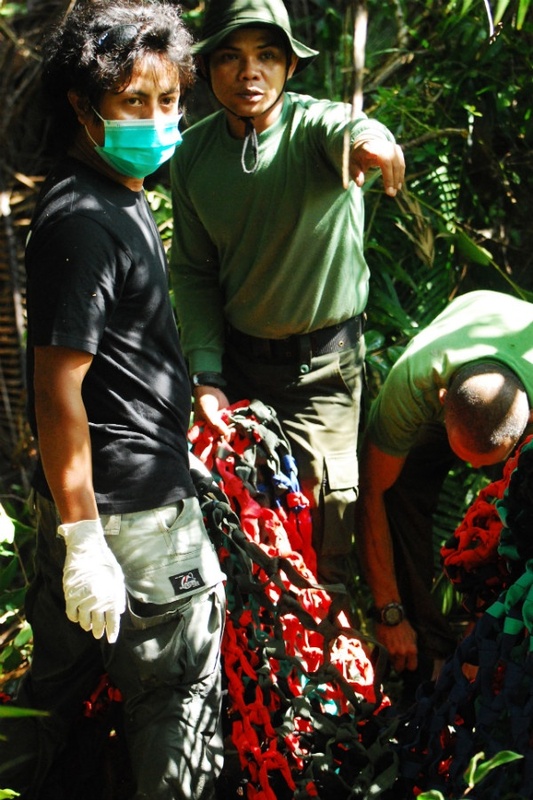 It was here that the team rescued A-Ul, a fully grown orangutan discovered on the fringe of a plantation. The giant male ape was in serious danger of being shot by local villagers, who were afraid of him being so close to their homes. The International Animal Rescue team worked quickly and efficiently to tranquilize A-Ul and bring him back to the center for a full health examination. Once he was determined healthy, the team released him deep into the forest, safely a full day's drive and hike away from where he was rescued. Because of organizations like The Great Projects and the programs they facilitate to rescue endangered species, what is considered "a once in a lifetime" experience for a tourist is a regular occurrence for a rescued orphaned ape. And in my book, the orangutans are not the only ones being rescued. Working as a volunteer of The Great Orangutan Project finally led me down that road less-traveled I was searching for. I have the Bornean orangutans to thank for that. The population of Bornean orangutans has declined by half over the past 60 years. Over 50 percent of their habitat has been destroyed in the past two decades by deforestation, logging, and hunting. The northwestern subpopulation has been most dramatically affected, followed by the northeastern and central populations. Touching orangutans is forbidden for the ape's protection. Compared to a human's complex immune system, orangutans can succumb to even the mildest of human illnesses — even the common cold can prove fatal. Avoiding physical , especially with the babies, helps in the rehabilitation process. Infant orangutans form strong bonds with their mothers, staying by their sides for the first eight years of their lives. They suffer major emotional trauma when the adults are killed. Looking for a replacement, the infants instantly latch on to their human caretakers, both physically and emotionally. Volunteers stay at the project for a minimum of two to four weeks before flying home. Forming a bond with baby orangutans for shorter periods of time creates mental scars that cannot heal. Do your research and become familiar with the situation on the ground. Visit the local NGO's website that you are working with (such as International Animal Rescue) to get an idea of their aims and what they are trying to achieve. Although The Great Project welcomes all volunteers, trade skills are invaluable. If you are good at carpentry, building, and especially welding, your talents are needed. Fundraising is also a major help — it costs over eight thousand dollars a month to feed all of the animals at the center. Hold events — balls, trivia nights, lectures or even bake sales. Every little bit helps. Check out website to see which project inspires you the most. The staff is very knowledgable and their service in fantastic — they are always available to assist volunteers. Owen Morgan is an aspiring writer and artist. You can follow him on Twitter at . He travels for the sense of discovery.